Blessed with an innate optimism and a magical childhood, Elisabeth Belle Sterling discovers that the path to happily-ever-after love is not as easily obtained as she had always imagined. The Camelot-like love she longs for seems like only a dream until she meets the handsome Kincaid Patterson, a West Point graduate who carries a dark secret from his past. Theirs is a passionate and unconditional love that has to confront a painful past, heart-searing separation, and the greatest of all tragedies. But the biggest obstacle is the loss of faith that threatens to undermine all that they have. Set in the South during the 1960s and 70s against the backdrop of the Vietnam War, Save My Place is a beautifully written love story of two people who search deep within their souls to save each other. This book also available in e-book format through Amazon, Barnes and Noble, and Kobo. With her popular book of essays, Miss Hildreth Wore Brown: Anecdotes of a Southern Belle, Olivia deBelle Byrd pulled at the funny bone of a multitude of readers. 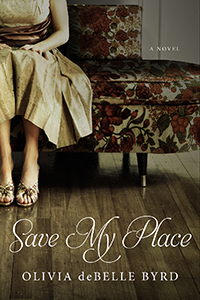 Now with her wonderful debut novel, Save My Place, she successfully pulls at the heartstrings. In a moving and grounded narrative voice, Byrd paints a portrait of new love, family secrets, unspeakable loss, treasured childhood memories, and redemption—all set against the backdrop of a changing world during the Vietnam War. Save My Place is as bright and uplifting as the Florida sun where the novel’s protagonist, Elisabeth, retreats to mend the broken pieces of her life. It is not to be missed. Olivia deBelle Byrd is every bit as clever and utterly delightful as her writing suggests. Save My Place is a stirring story about hard times and lasting love and the God who never leaves us. The first thing I liked about Save My Place is the author’s name: Olivia deBelle Byrd. If you can’t make it as a writer in the South with a name like that, well, you’re not really trying, are you? Save My Place is a charming read for almost anyone—young adult to senility. I’d be comfortable placing it in my Episcopal church library! It’s a sweet love story about ordinary Southerners, Elisabeth and Kincaid—I promise you they are quite authentic characters—facing war and personal tragedy with fortitude and grace. And if you have a fondness for love letters like I do, this novel offers some gems—the best pages of the book, I think. Kincaid may have the most romantic theory about anniversary flowers I’ve ever heard in my life. I’m glad I spent some time with these pages. Olivia deBelle Byrd is one of my favorite Southern writers—elegant, witty, and wise. In Save My Place, she employs all of those gifts to craft an epic love story that’s sure to fire the imaginations and passions of her readers. This is a tremendously moving tale of romance, faith, and patriotism—and a great reminder of all that’s true and lasting in life. Save My Place is a rare find, the kind of inspirational, old-fashioned novel you can’t wait to recommend to your friends. Gracefully, tenderly, Olivia Byrd has penned an uplifting story of love, loss, and the courage to carry on despite the inevitable heartbreaks life brings our way.